If your looking for a story with a happy plot line, I wouldn't suggest this one. 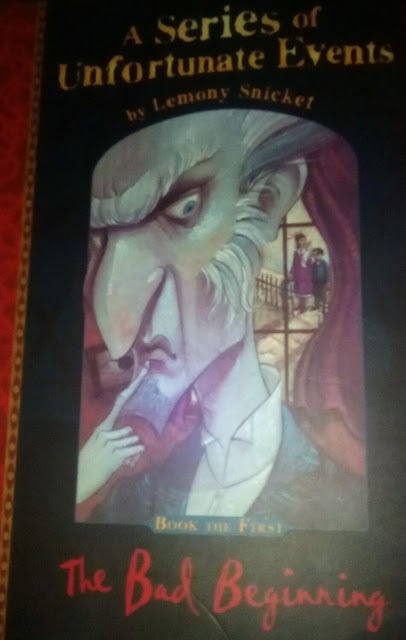 This is the first book in a 13 book series by Lemony Snicket following the life's of three children, Violet, Klaus and Sunny Baudelaire. When the children's parents perish in a fire and they lose everything the children are sent to live with a wicked and evil man named Count Olaf. The only thing Olaf wants is to get his hands on the Baudelaire fortune which the children will receive when Violet comes of age. The story follows the children in there new lives living with Olaf and his terrible plan to get there money. He will stop at nothing to get what he wants. I have read other reviews on this book who find Snickets way if writing. To be annoying and patronizing. Throughout the book, Snicket uses words and then explains what they mean for example on page 114 he writes " casing the joint, casing the joint means observing a particular location in order to formulate a plan"
While some people find this to be annoying and patronizing I myself find it adds a little humor and quirkiness to Snickets writing. Snicket also talks directly to the reader which I found really made you feel involved and part of the storey. I thought this to be a good plot technique. All in all I really enjoyed reading this book. I found I loved the characters of the three children, I hated Olaf and felt so sorry for the children for everything he did. I also found myself to be really annoyed by Mr Pie the banker. The characters in this book really grab you and make you want to read on, so just so I read this book in just a single night, I will now be moving onto the second book.